February 2018. Scott Webster, Billykart West End, Brisbane. A massive congratulations to this month's Petite Bouche Chef Of The Month Scott Webster from Billykart West End in Brisbane. We caught up with this humble English Chef to find out how he is settling into the Australian life and what his favourite Petite Bouche produce is at the moment. SCOTT ON THE PASS AT BILLYKART WEST END IN BRISBANE. Scott is from the UK and started his career washing dishes at the age of 15. 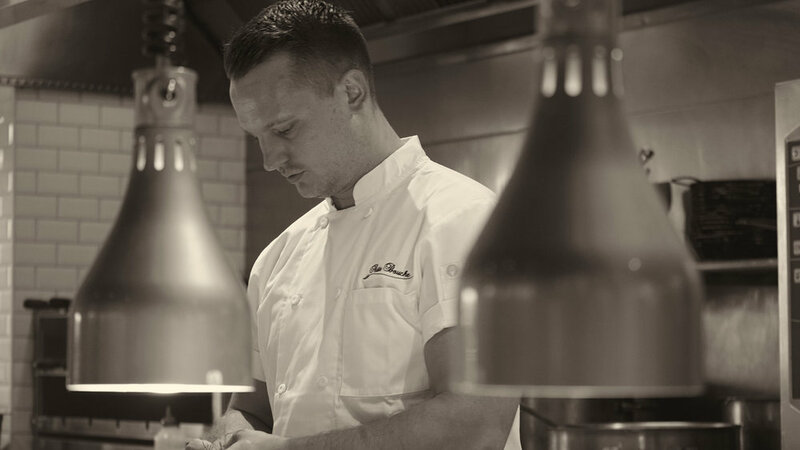 Working his way through the kitchen ranks he became obsessed with creating food made with love and eventually became the Sous Chef at 24 of The Hinds Head in Bray by Heston Blumenthal. At "The Hinds Head" he was apart of the team that served stunning food showcasing the skill, precision, flavour and originality you’d expect from Heston Blumenthal and his team of accomplished chefs. PAN FRIED PALMERS ISLAND MULLOWAY, TEXTURES OF CAULIFLOWER, TURMERIC, LAND SEAWEED, KARKALLA. Scott came to Australia in 2005 with a wealth of knowledge around British cooking and took the role of Head Chef at Billykart West End owned & operated by Chef, Ben O’Donoghue & business partner, Ben Roberts. AUSSIE ASIAN EGGS, CRISPY NOODLES, PRAWNS, BACON, DEEP FRIED EGG, OYSTER SAUCE, BI-COLOUR SHISO. The Billykart concept is set in the heart of eclectic West End in Brisbane with changing seasonal menus paired with a selection of boutique beverages, there’s a strong focus on the origin of food to create fresh, bistro-style dishes. SCOTT USES THE VERY BEST LOCAL QUEENSLAND PRODUCE ON THE MENU AT BILLYKART. DARK CHOCOLATE, PANNA COTTA. CHOCOLATE SOIL, STRAWBERRY SALSA, SORBET, PINEAPPLE SAGE.